As a maker, my process is constantly evolving, and recently an issue has arisen that has given me pause. It has been five years now since I took my sewing back up, after about a ten-year lapse. I sewed clothes for myself as a pre-teen, and then again just out of college, and yet again in my late thirties. But for most of my forties my making was dedicated to knitting. Late in that period I developed a pretty bad case of Epicondylitis, also known as Tennis Elbow, that forced me to stop knitting, entirely, for about nine months. This was the time when I became aware of the Modern Quilting fabric movement. Pretty sure it was Amy Butler’s Midwest Modern line that drew me in. I unearthed my Singer sewing machine, took it to be serviced, and starting sewing pieces of fabric together again. It took a little while to remember my skills, but, as the saying goes, it’s like riding a bicycle. You remember. Partially ergonomic memory, partially instinct, voices of early teachers, words from books, mistakes made, and fixed, it all comes flooding back. Anyway, that’s a story for another day, me re-finding my love of sewing. What is timely is where I am right now, five years into a dedicated sewing practice, making predominantly garments. I have a stash. I have excess. The photos that accompany this post are of that stash. At times it feels like wretched excess. I have piles of scrap fabric. (no, I'm not showing you that....) I have taken up quilting, and it does address some of this overflow. But honestly I am not quilting with my rayon scraps…. So there are small cuts of fabric piling up. 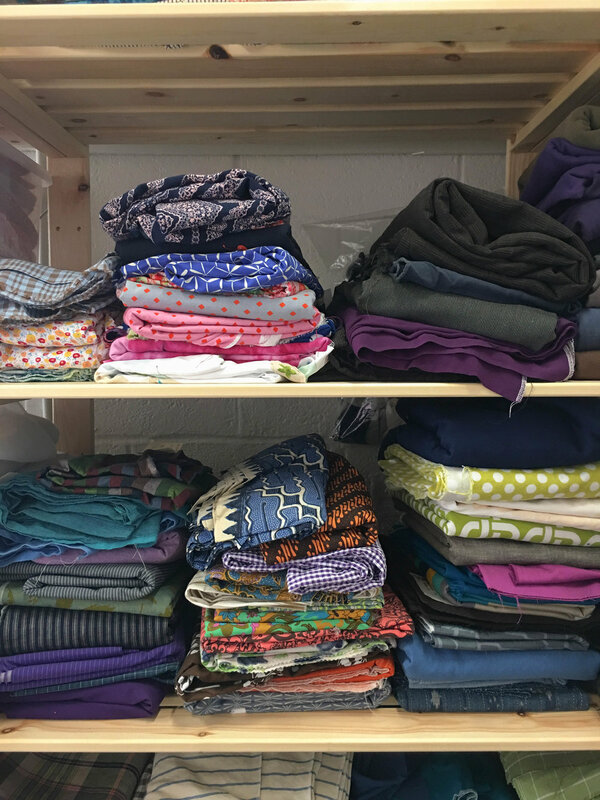 On the other end of the process, I have accumulated a sizable stash of completed garments that for one reason or another, I no longer wear. This category includes styles that no longer appeal to me, items I no longer fit (sigh), wearable muslins in colors and patterns that don’t really work for me, and items that just never really worked for me. I am pretty much 95% handmade garments in my daily wear at this point. So I have a lot of clothes to wear. Which means items that don’t sing to me, don’t get worn. I am starting to run out of closet space. More importantly my psyche is feeling burdened by these pieces of perfectly wearable clothing that are not being worn. I feel guilty. This is a guilt of my own making, and not one I want to project on anyone else. But it feels real to me..... I know that there is a glut of second hand clothing in the universe. No matter how virtuous giving to charitable organizations might make you feel in the short term, the reality is much of what you donate ends up in the third world, as scrap, or worse, in landfills. 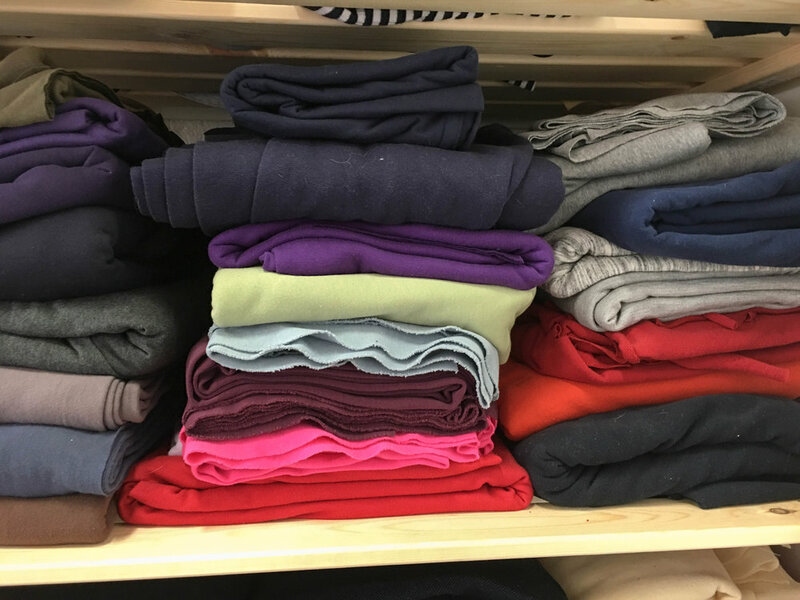 If you pay attention to Fast Fashion news, you know that there are millions of shoddy Tee shirts that are discarded a few weeks after their purchase, that end up in this system. That whole construct horrifies me. If you don’t know what I’m talking about, I highly recommend you watch The True Cost (film), it’s available on Netflix. There is also an article circulating in slow fashion circles about the problem with second-hand clothing. You can read it here. Having this knowledge has recently caused a schism in my Making construct. Well, that, and my overflowing closet. I have too many clothes. And unlike many people in this situation, my clothing is not disintegrating fast fashion. It’s handmade garments that will probably last a good long while. But I’m not going to wear most of this overflow. So what do I do with it? 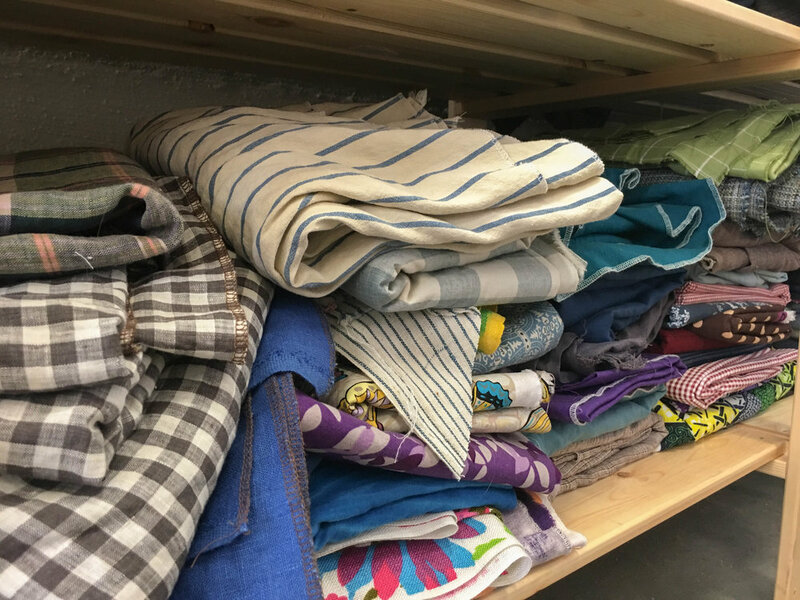 With the current conversation started, and generously guided, by Karen Templer for Slow Fashion October, I feel it is time for me to address this issue. A little background and context. My mother was born at the end of the Depression and was raised during the Second World War. She was never homeless, and always had enough food, but the issue of shortage was ever present in her young years. My Mother does not waste anything. She has always washed out tin foil and plastic bags and re-used them. She shops on the sale rack, always. She is constitutionally unable to buy anything at the regular price. Being her first born, even though my childhood was pretty comfortable, I absorbed these habits. I look for bargains. When I was younger, Loehmann’s was a store in New York City that sold actual high-end Designer clothing (the real stuff, not the current secondary market junk) for affordable prices. My Mother and I shopped Loehmann’s hard. Because even though she looked for good prices, my Mother still had a dynamic sense of style and recognized quality, workmanship, and good design. I remember one blouse we bought for me that was not dissimilar to the Wiksten Tova, in a lovely off-white cotton. We referred to that blouse as “the world’s most beautiful blouse’. And it was legendary for years. We gauged other garments based on their similarity to, or lack of, the “world’s most beautiful blouse”. I was instilled with this awareness of style and value at a very young age. The Vogue September issue was a regular read for decades. To my mind, there is little surprise that I like to sew my own clothes. My Mother also taught me to sew, so she gave me many tools with which to indulge in my love of clothing. 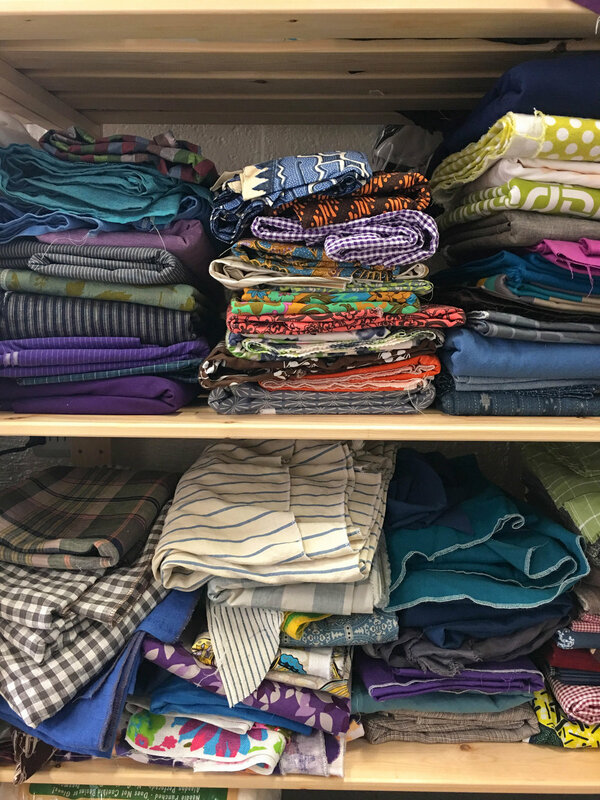 For the last little while I have been blithely sewing away, looking for my signature look, looking for flattering garments that make me feel good, searching for the perfect pattern. Style is an ineffable quality. We all have some version of it. Some of us obsess over it, others have it effortlessly, some disdain its pursuit. Wherever you fall on this spectrum, you are aware of it. At the ripe old age of 54, having cruised past Menopause, I am feeling increasingly comfortable in my skin, and aware of what my ‘style’ is. This has led to some pivoting in my wardrobe, and some insights about my earlier choices. So you see, we are back at that pile of handmade clothing. Most of it is perfectly lovely, well made, and fashionable. But it is not for me. So what do I do with it? I have certainly thought I could beat the system and find a charity that would actually use it. The article referenced above has squashed that belief. At points I have thought about holding a clothing swap….but I am an Introvert. The thought of spreading my clothing life out for others to paw through, to choose, or discard, in real time, has given me extreme pause. I have thought about perhaps selling it (at reasonable prices) as one would sell one’s stash. I do not know what to do about it all. As the conversation about Slow Fashion blossoms during this month of October I am hoping some clarity will present itself. Perhaps someone else out there is wrestling with this issue. Are you? Do you have any ideas about what to do?